Machines used to help people having a sudden cardiac arrest were placed around Valletta on Thursday. Eight automated external defibrillators (AEDs) were placed around the capital which can be used to prevent or correct an arrhythmia as well as restoring the heart’s beating if the heart suddenly stops. In a statement the Government said that Valletta is the first locality to offer a ‘public medical service’ which could be used by the public to save others in life-threatening situations. The Government also announced its plan to install AEDs around the country. The remaining AEDs will be installed in the coming days in front of M&S in Strait Street and in front of Suq tal-Belt in Merchant’s Street. Health Minister Chris Fearne said that a third of the deaths in Malta were related to heart conditions. 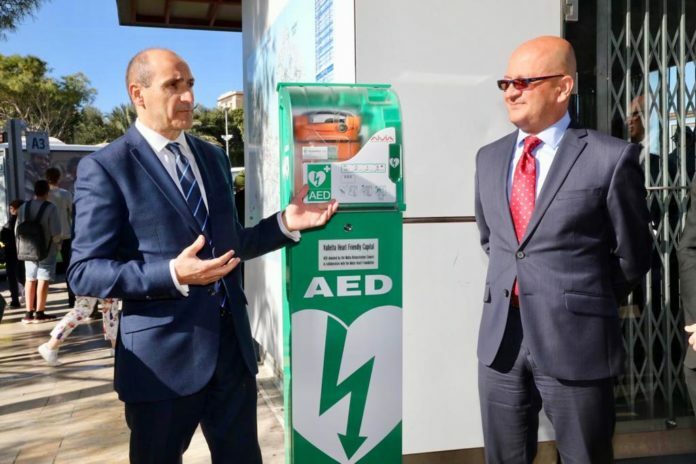 The service was launched in a press conference for which Health Minister Chris Fearne and Valletta 2018 Parliamentary Secretary Deo Debattista were present. Malta Health Foundation and Malta Resuscitation Council were also present for the launch.